A MacMine kiadott egy ismertetőt, amivel bárki kedve szerint megváltoztathatja az iBook-ja hátulján az alma színét. Bár egy kis csavarozás, meg miegymás kell hozzá, ha elég ügyes vagy szép zöld almát is varázsolhatsz a notebook hátára. 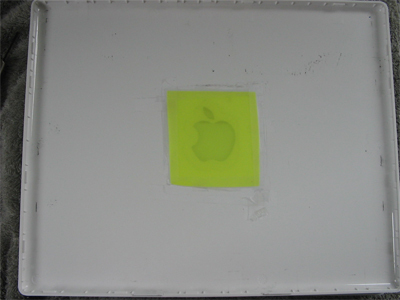 Make sure you set your iBook on a cloth of some kind, to ensure that it does not get scratched. Turn it off, and leave it off for at least 15 minutes. Then, flip it over to remove the battery; use a quarter to turn the metal knob to the unlocked position. The battery should pop out. 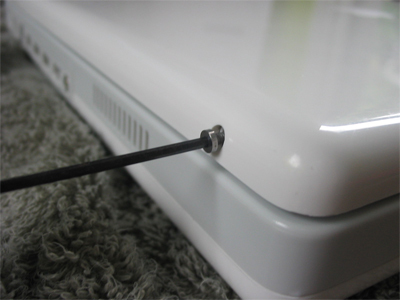 Flip your iBook back over and take the Allen Wrench to unscrew the screws on the backside of the screen (where the Apple logo is located). Be sure to store these screws in a safe place. 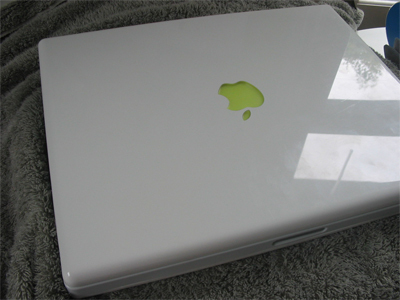 Now, open your iBook so that the screen is visible. 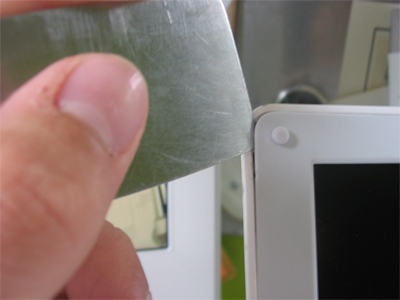 Proceed by taking your putty knife and inserting it between the screen’s backing (shell) and the screen. Pry the two apart until the shell comes off; you may hear a snapping sound. Insert the putty knife into multiple places between the screen and backing and gently pry until the shell comes off. Here’s where you get to customize your baby! Take your sheet of colored paper, graphic, or piece of colored plastic and tape it with regular scotch tape to the inside shell. We found that colored plastic from binders dividers work best. These can be found at any office supply store. 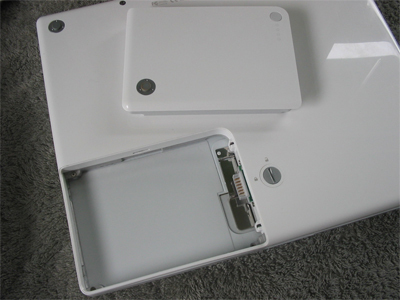 Put your iBook back together by snapping the shell into place. Make sure you work around with your hands pushing in every possible spot to ensure that it is properly attached. Then screw the screws you removed earlier back in, and your baby is (somewhat) modded! That’s all, folks. Easy eh?